Mantis Radio is one. We take a look back over the last year with our first Anniversary Special. Can you believe Mantis Radio is now 1 year old. The show started last May and was a up to the 8th broadcast, a 3 hour monthly. Now we’re a bi-weekly 2 hour show and we’re showing no signs of slowing down. It has been a wicked year for us and I am most proud to have been producing such a well received show. We’ve had some seriously amazing showcases from all over the electronic music scene. 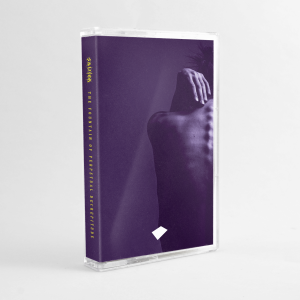 Each with a leaning to the darker, deeper sounds. A massive thanks to all who have listened in, downloaded, podcasted, sent us abuse through the forums and all those silent listeners. An even bigger thanks to all of the 16 showcased artists, producers and DJs we’ve been so lucky in providing you guys with. Please show your support by keeping these artists in work by buying their tunes and seeing them perform. 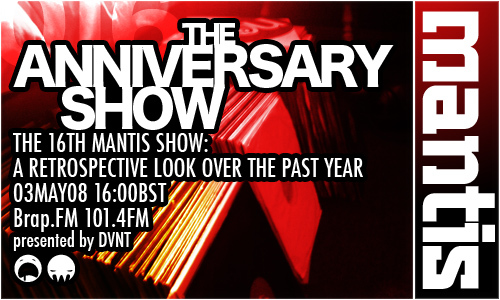 For this, our 16th show, we celebrated our anniversary by having a retrospective look at Mantis over the past year. Picking out some of my and indeed our listeners favourite tracks, as well some snippets from our most downloaded showcases.